From bawdy murals in sixth-century Pompeii, to East Harlem’s Wall of Fame in New York, it’s hard to ignore the impact street art has had on the socio-political climate, and art-culture of the world. In almost every age of history humans have been eager to leave their mark, (We’re sure you’re all familiar with the hurried scratchings left by starry-eyed teenagers on the back of the public-toilet-door). But when you think of street art, what are the places that come to mind? Who are the artists? Basquiat in New York? Pez in Barcelona? The latest Banksy? Well yes, you’d be right. But too often we overlook the incredible art that is happening all around us, in our very own cities. As you’ll come to learn, Brisbane is rich with open-air art – from historical sculptures to contemporary murals, it’s fast becoming a contender in the street-art world. Of course some locals have been aware of this for some time, (including us – more on this later! ), and have curated a festival devoted to encouraging and celebrating this diverse art culture; Brisbane Street Art Festival BSAFEST is back for its third year from March 31st to April 15th. The festival will see large murals painted throughout the city by both local and international artists, with people encouraged to watch the artists at work as well as admire the finished product. This gives the public a chance to be immersed in the whole creative process, and is part of the festival’s larger aim – to foster positive engagement between artist and community. There will also be a diverse creative program involving music, theatre, workshops, and light shows. 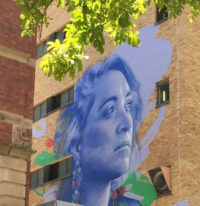 One of the most impressive murals from last year’s festival has now become a permanent fixture on the Telstra Exchange Building at 280 Elizabeth Street. It features a portrait by emerging Australian artist Claire Foxton, of Alethea Beeston from the Queensland Museum and Digi Youth Arts. It seeks to recognise her extensive work with young Indigenous kids in art, and is also just one of the many incredible artworks we visit and discuss on our Art + Design Tour. We are passionate about celebrating local art and artists, and have the knowledge to prove it. So if you’d like to get a head start on the festival, or want to become better acquainted with Brisbane’s rich art scene, we’d love to see you! Our small group walking tours cater for 1-8 persons, so don’t be afraid to come alone. Our guides will love the chance to chat with, and get to know you!